The new generation: from now on with Viewfit function! 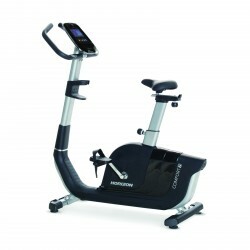 The Horizon Comfort 7i is an exercise bike of a good workmanship and a high training comfort. Furthermore, it is Passport Ready, that means you can connect it to the tv and cycle realistic tracks. 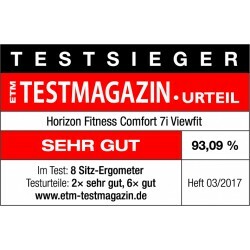 The latest generation of the Comfort 7i is now also compatible with Viewfit. The Horizon ergometer Paros Pro is the "big brother" of the Horizon Paros and offers a watt-controlled program (variable from 24 to 350 Watt). 16 programs make your workout varied, the backlit LCD display informs about all important workout data. 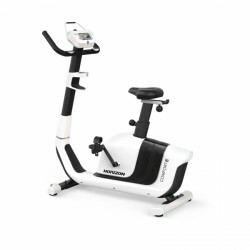 The Horizon exercise bike Comfort 8i Viewfit is a modern bike trainer for every age. 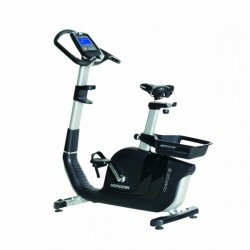 The exercise bike has a multi-position handlebar with hand pulse sensors, the saddle is vertically and horizontally adjustable, the step-through is very low for an easy getting on and off. 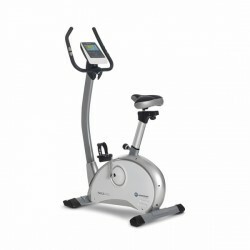 The Horizon exercise bike Comfort 8i Viewfit makes a health-oriented fitness training very comfortable. Passport Ready: connect the Horizon Fitness equipment with separately available Passport Media Player to the tv and experience fascinating training tracks! The Horizon recumbent ergometer Comfort Ri lives up its name with the comfortable seat, deep entrance, and easy-to-use training console: the recumbent bike is just comfortable. Connect it with your tv via the Passport Media Player and cycle realistic tours all over the world. The Horizon Comfort 3 is a beginner exercise bike with a good comfort. It offers a comfortable, deep step-through and individual adjusting possibilities for the optimal sitting position. The training computer is easy to use and offers 10 diversified programmes. The ergometer Comfort 5i of Horizon Fitness has sporty handles like a bike. This provides good stability and familiar training positions. 12 programs make the workout varied. Horizon Fitness presents a large range of high-quality exercise bikes and recumbent bikes, which meet all needs of ambitious leisure sportsmen as well as of professional users. The exercise bikes of Horizon Fitness convince by a very special comfort, good equipment, and new technologies. Exercise bikes of the Paros series of Horizon Fitness present the ideal combination of an excellent price-performance ratio and good equipment. 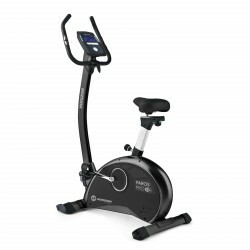 The Paros exercise bike series includes the beginner model, the exercise bike Paros as well as its improved successor, the exercise bike Paros Pro. 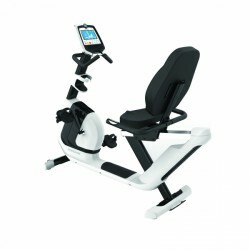 In contrast to the exercise bike Paros, you can train watt controlled with the exercise bike Paros Pro. The training intensity of the Paros Pro can be set in 5 Watt increments from 25 to 350 Watt. An adjustable Ergo handlebar with integrated hand pulse sensors, an ergonomically shaped comfort saddle as well as a multitude of training programmes are just some features which characterise the Paros machines. A distinctive quality feature or exercise bikes and recumbent bikes of the Horizon Fitness Comfort exercise bike series is the excellent comfort. The highlight of all Comfort machines is the very deep step-through, which is easy and comfortable for everyone. Thus, a comfortable exercise bike training is made possible for older users or persons with movement limitations. An adjustable multi-position handlebar and high-quality gel saddle provide even more comfort. 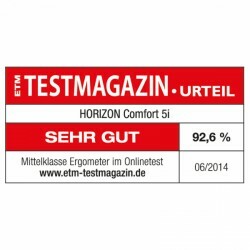 The machines of the Comfort line offer a number of further advantages. All models of the Comfort consols have a Smart Device holder for Smartphones or tablets. The consoles are intuitively to use and a circular heart rate display shows your data clearly and understandably. While all exercise bikes of the Comfort series offer the classic position of a street bike for experienced leisure cyclists, the recumbent bike Comfort Ri provides a special sitting comfort for older persons, users with back problems or other physical limitations. 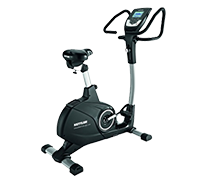 Compared to the machines of the Paros line, the Comfort exercise bikes (except the beginner model Comfort 3) are equipped with an induction brake. It works maintenance-free and allows to set the resistance in 30 levels. 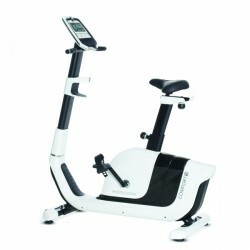 The top model of the Comfort series is the exercise bike Comfort 8i. In contrast to the Comfort 7i, the Comfort 8i is equipped with even more training important programmes (16) and a smart energy mode. The exercise bike Elite U4000 and the recumbent bike Elite R4000 present the Horizon Fitness Elite exercise bike series. These machines offer a very high training comfort and first-class quality. While the recumbent bike Elite R4000 makes the access very easy and comfortable thanks to its well-thought out frame design, the exercise bike Elite U4000 convinces by its multi-position handlebar and comfortable ERGO saddle. Both models are equipped with the same console with 14 training programmes including two heart rate and three user programmes. The Horizon Fitness exercise bike, which feature “Passport Ready”, work with the unique Passport Media Player. You can conquere really shot training tracks via the tv with the optionally available Passport Media Player.